The nice weather has everyone out walking their dogs, but at the parks around town at this point, you still need to keep them leashed. The City of Page looking at the idea of creating a dog park where you could let your pooch run around and play with other dogs without you attached. 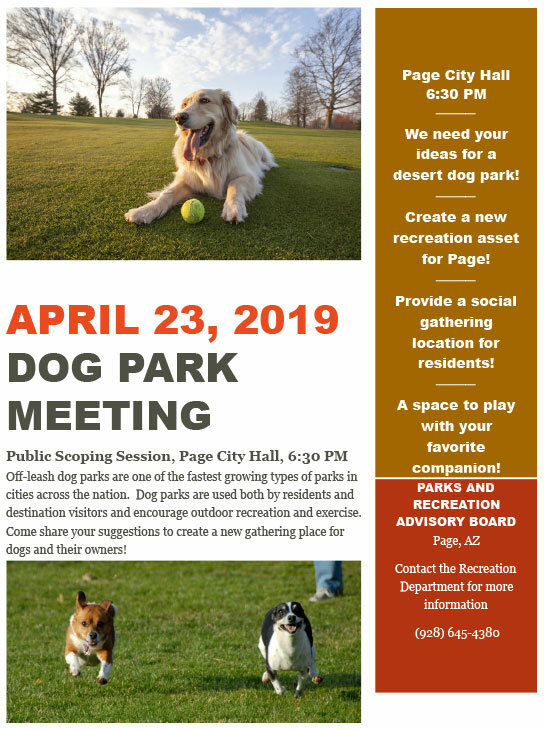 Two weeks from today, Page Parks and Recreation Advisory Board will be holding a public scoping session to see how other residents feel about creating a new dog park; perhaps a spot in the desert that offers a vast area to run? A place that could easily become a new recreation destination for canines and the folks who love them. The sky’s the limit on what the new park could entail– pun intended- that meeting Tuesday, April 23rd at City Hall 6:30 pm.